Letting your fire sprinkler system go uninspected can lead to some dangerous and deadly results. We all know how important it is to inspect our sprinkler systems. With that being said, some deficiencies occur more often than others. These common issues can be easily fixed but need attention as soon as possible. Letting your fire sprinkler system go uninspected can lead to some dangerous and deadly results. Here are just some of the more frequent fire sprinkler deficiencies that inspectors traditionally encounter. Dust or some other foreign material like paint could keep your sprinkler heads from working properly. When your sprinkler heads can’t dispense water effectively, you could end up with some serious fire damage if a fire does break out. In fact, a malfunctioning sprinkler head is not something that anyone wants. 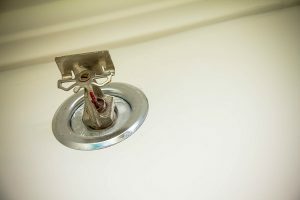 If there is a lint or dust issue you can use canned air to clean otherwise, you should get the sprinkler head replaced so you can rest easy knowing that your fire sprinkler will do its job when needed. Just like relationships, sprinkler systems run into issues every five years or so. In fact, according to the NFPA, a fire sprinkler system must have a complete and comprehensive five-year inspection conducted in addition to the annual inspection. As a result, keeping an organized log of the last time your fire sprinkler systems were inspected can allow you to stay on top of things when it comes to all the fire preparedness you should have. As mentioned, sprinkler heads need to be in proper working order at all times. Testing the heads of your sprinkler systems can ultimately provide some valuable insight into how your fire sprinkler systems are working. In fact, following all NFPA guidelines regarding testing and inspection can leave you and your family with a fire safe home that will work properly when a fire does break out. This entry was posted on Wednesday, February 7th, 2018 at 9:54 am. Both comments and pings are currently closed.